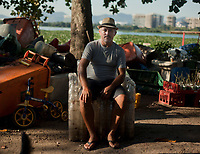 José Cavalcante, better known as Zé da Rádio, frees his silent struggle against people who carelessly throw garbage into the water or on the banks, altering the delicate ecological balance of the lagoons of Barra de Tijuca, south of the city of Rio de Janeiro , Brazil. Radio announcer in Pernambuco, north of Brazil, 5 years ago moved to the lagoon of Jacarepagua to clean it with his wife Barbara (20) and their two young children In a boat built by the same, runs the lagoon two hours in the morning and another two in the afternoon and he gets alone to collect 30 tons a month of garbage, such as bottles, toys, cans and even TV and syringes. Your Voz de las Lagunas Facebook page receives one million visits per month. Ze da Radio is doing a job of removal on its own what many governments promised to do but did not do. The most visible consequences of the contamination are the sudden and massive fish mortalities, and the less visible the emanation of extremely high gases for the human being. Ze's dream is to buy a large boat adapted to the garbage collection in the water, with the support of the condominiums of the same Barra de Tijuca, which has a population of medium and high resources so that the system of the lagoons is again clean like 50 years ago.